J1, J2, J3 VK200 (inductor of high frequencies). L3 Wrap 20 coils cupreous wire of (0,3-0,4mm diameter) convolution round a resistance 2,2W/2W of coal. Y1, Y2? Crystal hails. (You can you put the so much, those who also channels that you want you emit). See here. ANT1 Aerial for CB (For the trials is enough a piece wire of few metres but better connects a regular aerial so that does not have many stagnantly and burns the transmitter). S2 Switch of choice of channel. It has so much places, those who also the channels that you want pja'nete. (Kaly'tera he is mechanically connected with the S1 of receptor for simultaneous change of channels). J1 VK200 (inductor of high frequencies). D1 Passage of germanium (AA119 or OA92 or..). For the regulation it needs a voltmeter (with needle better) and charge 50W/5W. Connect charge 50W in the place of aerial, with the voltmeter in the exit voltmeter. Be supplied the transmitter with + 12V. It will be supposed we have consumption between 0,7-1A. We connect the microphone and speaking we observe the clue in the multimeter. If all have become right will be supposed the tendency, speaking, to go up roughly 30-35%. CB transmitter electronic circuit. 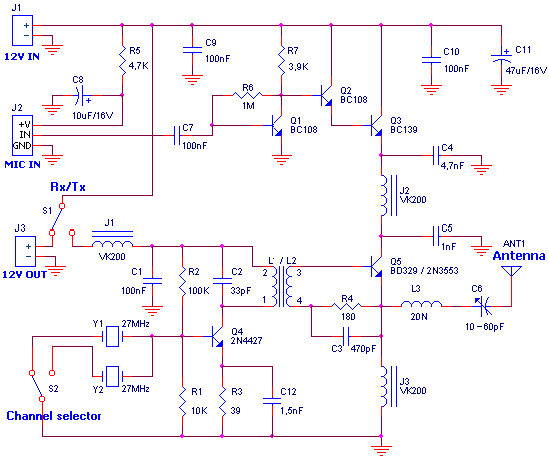 RF circuit electronic circuits and schematics.